Are you ready to find out why Veneto is the Italy's most visited region? Either you have already made up your mind and are going to leave for the the magic of Veneto, Italy, or you just wish to get some information, you are at the right website to dive deep into this italian wine region, which encompasses Venice and its mainland as far as Verona and the lake of Garda. ..and it is way more than just Venice..
just know that this is the most visited region of Italy - yep, even more than Tuscany:) - and by tourists from all over the world! Nevertheless, you will also find plenty of tranquil and uncrowded places to relax enjoying the natural and cultural beauty of the region. Imagine traveling across a land that embraces endless landscapes and natural settings in a relatively short distance. Being not far from the centre of Europe, in no more than a couple of hours you are able to drive wherever your mood takes you. Through this insider guide you'll find first-hand information, and unique suggestions about what's worth seeing and where to go during your holiday in this Italian region. After all, I was born in this part of Italy and have lived here for most of my life, as I do currently!... So, I guess I kind of know a bit about the area:-). spending an unforgettable italian holiday visiting magic towns like Venice, with suggestions on things to see and both on the best luxury and cheap hotels in the lagoon town. 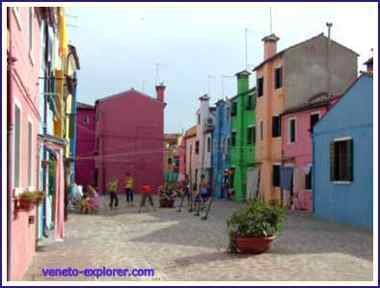 Not to forget some of its colorful islands like Murano Burano and Torcello. While there, you might also want to take a look at some genuine Murano's chandeliers or antique glass, or buy an authentic venetian mask ...here you might find suggestions and tips. you might want to take a trip to super romantic towns like Verona , with a photo stopover at the Romeo and Juliet balcony as well. Or take a day trip to the ancient cultural hub of Padua where there is one of the world's oldest universities. Do not forget Vicenza, the capital of Palladio architecture, or the pictoresque Treviso. want to go back in history,and feel like a King or Queen in an ancient castle? go for hilly medieval towns and villages like Asolo, Marostica, Soave, Bassano del Grappa, etc. do you feel like climbing up a wine route and going wine tasting at one out of the many wineries spread all over the hills of Veneto? Do you like Amarone wine or would you rather have the white sparkling Prosecco wine? The Veneto's wine is top quality and has a very long tradition in this important italian wine region! Follow me onto the enchanting hills of Valpolicella and Valdobbiadene for a stopover at one out of many wine farms. Not to mention about the fine Veneto food that you absolutely can not miss! or maybe, you want a romantic trip to the lake of Garda's quainty villages with vineyards and olive trees all around. are you passionate about mountains? what about hiking or skiing in the Dolomites, some out of the most breathtaking mountains in the world? The are really majestic and unique! Not to mention traveling further eastward to the beaches of the warm mediterranean sea! Last but not least, you might want to visit some Renaissance villas spread all over the Veneto's country and hills. As this italian region is home to one of the most important architects ever, Andrea Palladio (hence "palladian architecture"), who designed some of these buildings. Find here suggestions and itineraries for your visit to some of the 4,000 (four thousand) and something aristocratic villas of this varied Italian region. No way will you get bored in Veneto. It's a promise! Medieval towns and villages, medieval castles of Veneto, Italy. The Best Italian Wine as rated by Wine Experts and Personal Taste.